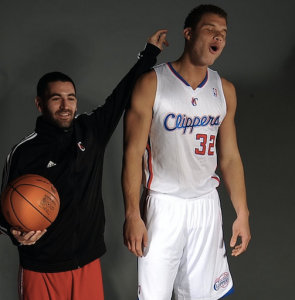 Los Angeles Clippers forward Blake Griffin repeatedly punched a Clippers equipment manager, Matias Testi, over the weekend and broke his own hand in the process. If Griffin was an unknown person with a regular job, making a regular person’s salary, the fact that he punched a co-worker would likely mean Griffin would be fired and possibly prosecuted. Little doubt there is more to this story than the punches thrown and landed. Complicating this incident is the fact that Griffin and Testi are friends, at least they used to be. What would spark such a violent act? At this point we can only speculate – something I’m not going to do. Bottom line, it shouldn’t have happened. Clippers coach Doc Rivers and owner Steve Ballmer must decide how to move forward. I’m sure releasing Griffin is not out of the question. Will Sunday be Peyton Manning’s last game? Is this the final showdown between two of the NFL’s all-time greatest quarterbacks? I’ve spent the last several days consumed by reports, and commentaries about the ugly actions that intimidated and served to disrespect and dishonor Jonathan Martin, the Miami Dolphins lineman who last week said he had had enough and walked away from his team and teammates. Several things strike me about this. The first is the obvious: what possessed Richie Incognito to target Martin in this way, with nasty, racially tinged emails and text messages and perhaps other actions that have yet to be reported? What kind of human being says and does this to another? This could not have been part of the dubious tradition of rookie hazing, since Martin was no longer a rookie. And why Martin? To this point there is no evidence that Incognito was treating other teammates this way. With justification the Dolphins have suspended Incognito indefinitely, and the NFL is now investigating this incident with the potential that other penalties could be levied. Just as puzzling: why didn’t other Dolphins players intervene? 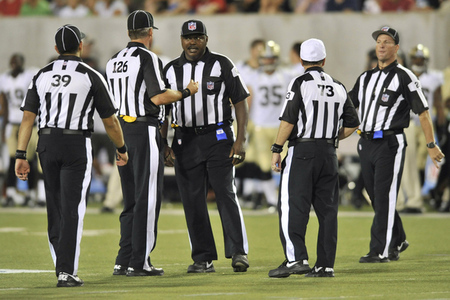 They had to know something was wrong, especially Martin’s fellow offensive linemen. Did they feel it was not their place to take sides? Did they also see this as part of the NFL experience and that Martin would and should find a way to handle this on his own? Further none of what has come out over the last few days explains why a number of Martin’s teammates participated in the fateful lunchroom stunt that finally broke Martin’s spirit and caused him to leave the team. Underlying all of this is the unspoken code of conduct and silence that governs many team sports and player interactions. This code condones rookie hazing, pranks, mild financial coercion and other actions. Most of which falls under the questionable rubric of team building and bonding. 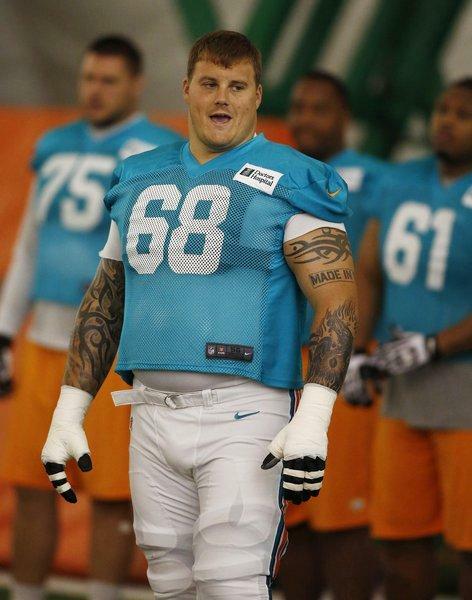 But clearly whatever bond there was between Martin and Incognito and perhaps other teammates is broken, more than likely irretrievably. It would not be surprising if both players never play another down for Miami. Also clear is that while today we focus specifically on the nasty rift in Miami, in a larger sense, this isn’t just a Dolphins’ problem, its a bad human being problem. Sadly, I hear and read remarks from too many who wonder why Martin didn’t literally fight back or at least confront Incognito. What I say to that is, we are not inside Martin’s head and soul. We have no idea the totality of what he experienced from Incognito and others. Based on what we know, he was victimized, bullied and unprotected, plain and simple. No one deserves this. 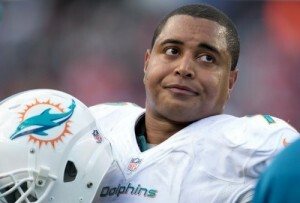 Even a man as large as Jonathan Martin. But as I write this, and it is still early, there are things that remain very unsettling, like Incognito’s indiscriminate use of the N-word toward Martin which has not been roundly condemned by Dolphins players, especially Martin’s African-American teammates. This is a messy, ugly and fluid situation, but it is also one that actually shines the light on bad and shameful behavior generally, which all of us can and should learn from. Probably the most anticipated regular season football game in Indianapolis Colts history will take place Sunday night when the Colts take on the Denver Broncos, or more accurately, when the Colts take on Peyton Manning. What Manning did for the Colts over 14 seasons was remarkable. The Colts won more games in a ten-year period than any team in NFL history, largely due to the laser-accurate right arm of Manning who, like a maestro, literally orchestrated the Colts high-powered offense. During that time Manning won four league MVP awards and a Super Bowl. But as much as this game revolves around Manning, the co-star in Sunday’s drama is Manning’s replacement in Indianapolis, Andrew Luck. Luck, who was the first player picked in the 2012 draft is the reason the Colts felt comfortable parting ways with Manning. Of course having the NFL’s worst record while Manning sat out the season with a complicated neck injury made the selection of Luck possible. Luck has been everything the Colts could have hoped for. He is to many expert observers the best of an outstanding crop of young quarterbacks and is rapidly climbing the ladder of the league’s top signal callers. Many of those same experts say Luck is better at this point in his career than Manning was. But what makes this game not just dramatic but important is the fact that Manning is having the best season of his storied career. And the Broncos are undefeated and considered the favorite to represent the AFC in the Super Bowl. But the Colts, despite a slip up against San Diego this past Monday, also look strong enough to be considered a real challenger for the Super Bowl themselves at 4-2. One of the interesting and controversial subplots leading up to Sunday night’s game is a statement made by Colts owner Jim Irsay which Broncos coach John Fox called a “cheap shot” at Manning. What Irsay said in sum was that he wants to win more than one championship with the current Luck-led roster. To which I say: what NFL owner doesn’t want to win multiple Super Bowls? And what NFL owner wouldn’t be a bit disappointed to have only come away with one Super Bowl win when he had a team led by one of the all-time greats? If that fact-based wish is a shot at Peyton Manning then so be it. Still, expect hundreds if not thousands of Manning fans dressed in either number 18 Colts jerseys, or number 18 Broncos jerseys as reverence for Manning remains just that strong in Indianapolis. Tickets on the after market are already going for record prices, and NBC which will televise the game can expect its highest ratings of the season. 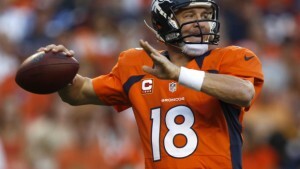 As for the game itself, the Broncos based on their record and Manning’s play, should be favored. So it won’t be a surprise if the visitors win. But the Colts are not be taken lightly. And my gut says Andrew Luck will lead the Colts to victory with another one of his fourth quarter rallies. My only hope though, no matter who wins, is that Peyton Manning looks good too and leaves the game unscathed. The worst outcome would be the sight of Manning limping to the sidelines in the majestic stadium he helped make possible. Although some words, standing alone, carry more weight than others, the context in which they are used must also be considered. In the case of Philadelphia Eagles wide receiver Riley Cooper who has now been excused from team activities to undergo counseling, it isn’t just that he uttered the infamous “N” word, its really about how and when he used it, and why. Some will get caught up in the word itself, which by today’s standards should never, ever be uttered by any non-African American, and especially never be used by anyone who is white. Those are the rules. But rules notwithstanding, the contradictory fact is that some of the sting has been taken out of the N-Word these days because of the wide use of its variant that ends with an “a”. It is uttered proudly as a greeting by many African Americans, and used to spice up years and years of Hip Hop and Rap song lyrics, which ironically are enjoyed and sung along word for word, eagerly and without incident, by millions of non-black music consumers. But the complicated N-Word rules demand that once a non-black person isn’t singing along and uses the more vile historically onerous N-Word that ends in “er”, a line has definitely been crossed. 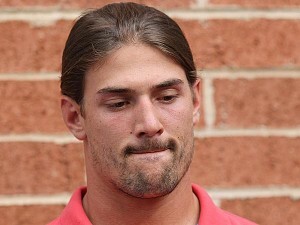 Worse yet is when the word is used to intimidate and de-humanize, which is Riley Cooper’s real sin, and why, despite his profuse apologies, he has been fined, forced into counseling and is being ostracized by many of his teammates. While his apology suggests that this was a rare and perhaps first-ever use, we must still ask: Why did Cooper feel the need to racially threaten and demean the African American security guard at the concert he attended? What was he thinking? What is in his heart? Hopefully counseling will provide Cooper with much needed answers and perhaps save a career that may now be in doubt. One also hopes though that while Cooper contemplates his actions and his words, all of us, of whatever color and race re-examine the use of the N-word which has been de-stigmatized by our casualness, callousness and perhaps hatred, sadly disregarding the millions whose lives have been damaged and sometimes taken away because of the cruelty this ugly word has tragically instigated. Lance Armstrong apparently came clean to Oprah Winfrey on Monday by admitting to blood doping and using PEDs. One of his spokespersons said that he would speak “directly, honestly and candidly” to the talk show host. We get to see an edited highlight of that interview on Thursday on Oprah’s cable network, OWN. I have long had mixed feelings about Lance Armstrong, most of them not so good. But finally telling some version of the truth to Oprah doesn’t make me feel any better about the guy. What I do know is that Armstrong is a consummate salesman. Years ago he successfully sold just about everyone on a seemingly honest and miraculous story of overcoming life-threatening cancer and becoming a champion. As legend has it, his seven Tour de France titles were the result of Armstrong’s incredible will and his committment to training, hard work and faith and nothing else. He always vehemently denied drugs and blood doping ever played a part in his success. But now we also know that Armstrong toyed with the admiration of legions of unsuspecting fans who celebrated his triumph over testicular cancer and bought whole the incredible symbol of hope that he became. And with each racing victory Armstrong was literally authoring one of the most inspirational sports stories ever told. The thing is only his victory over cancer was achieved honestly. Lance Armstrong’s powerful fable was fortified by the establishment of one of the great charitable foundations of our time – Livestrong. Millions of yellow rubber Livestrong bracelets became iconic symbols of the fight against cancer. And helped the foundation raise millions of dollars for cancer research. Just as importantly those bracelets served to enhance Armstrong’s image and virtually inoculated him in the face of mounting suspicion that he didn’t win his races without illegal assistance. To be fair though, Armstrong was the very best cyclist in what we’ve discovered was an almost totally corrupt sport. It turns out that just about every top cyclist over the last two decades has been implicated in the doping and PED scandal. So yes, I get why Armstrong lied, and know that he wasn’t alone lying and cheating. I accept that he did what he believed he had to do to compete and win. But what I don’t understand is the way he allegedly treated those who spoke to authorities about cycling’s doping scandal and his involvement. Some of those people at one time were Armstrong’s close friends and teammates. And if reports are true, Armstrong viciously tried to ruin the lives of some who spoke against him. I do hope Oprah asked him about those deplorable actions. So what is the underlying motivation for him to tell his story now? Armstrong, who is as shrewd at public relations and cynical self-preservation as any sports figure has ever been, has to have an angle right? I have little doubt that this is all about winning sympathy and rehabilitating his image and very little about humility and contrition. But I wish I didn’t feel that way. Nonetheless I will be watching closely to see if I’m wrong and he really does come clean and sound sincere for a change. Few things in life are more satisfying than a real good “I told you so!” And right now I’m feeling pretty satisfied about Russell Wilson, the undersized, rookie quarterback, who on Sunday led the visiting Seattle Seahawks to a playoff victory over the Washington Redskins. There have been doubts all season about Wilson, detractors wondering when his size was finally going to work against him. It hasn’t happened. It likely won’t happen. Actually the doubting about Wilson started well before the season began. Let’s look back to last April and the NFL draft. Wilson was the 75th pick, taken in the third round. Even the team that took him, Seattle, waited until then to take a “chance” on the All-Big Ten quarterback from Wisconsin who stands just under 5’11”. Seattle had just signed promising Green Bay backup quarterback Matt Flynn to a big money, multi-year deal, with the belief that Flynn would be their quarterback of the future. But Seattle head coach Pete Carroll using common sense that too often eludes NFL decision makers once they’ve laid out big bucks, saw early on that Wilson was actually better than Flynn. And to Carroll’s credit rather than try to justify the dollars paid out to Flynn by making him the starter, Carroll trusted what he saw in Wilson – a cerebral, strong-armed, athletic leader. Carroll’s stunning decision, which went against the grain of conventional wisdom, is now paying huge dividends as Seattle moves on to Atlanta to take on the Falcons in round two of the playoffs. Wilson’s surprising ascendence though has not quite removed the expansive shadow cast by two other outstanding rookies, Andrew Luck and Robert Griffin III, aka RG3, who were taken one-two in the draft. Most of the media’s attention was focused on the exploits of those two for most of the season. And indeed Griffin and Luck played very well for their respective teams, Washington and Indianapolis, leading them to the playoffs as well. But as the season wore on hype or not, it was becoming harder and harder to ignore what Wilson was doing in the far northwest corner of the country. It was beginning to look like he may be the more complete rookie quarterback. Wilson kept his mistakes to a minimum, with only 10 interceptions, something that plagued Luck, who led the league in turnovers. Wilson was also a dual threat, but he ran smartly and avoided big hits, something that RG3 will have to learn to do more of next season or risk another major injury. 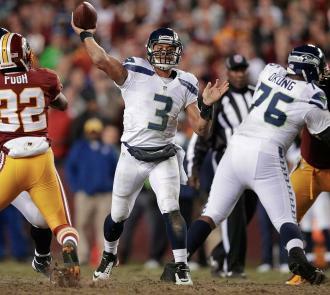 Wilson also finished the regular season tied with Peyton Manning for the most touchdown passes by a rookie with 26. Still it likely took Sunday’s showdown just outside the nation’s capital to convince remaining doubters that Wilson was at least the equal of RG3 if not better. And playing earlier in the day less than 40 miles away in Baltimore, Colt’s rookie Andrew Luck showed in a loss to the Ravens that he still has a lot to learn and that despite being 6’4′ his passes can be blocked and tipped. 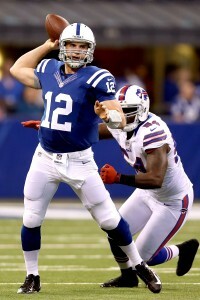 In fact Luck led the league in passes being knocked down. Despite the numbers, and the visual evidence, I know not everyone will be convinced that Russell Wilson is the best of the three stellar rookie quarterbacks no matter how hard I plead his case. But right now he’s the only rookie quarterback still in the playoffs and that’s enough for me to say – I told you so. With only three games left in the regular season debate is intensifying about who should be this year’s NFL MVP. Friends of mine, like so many others, believe the MVP award, at least at this point in the season, must go to Peyton Manning, who like the mythical Phoenix has risen from the possible ashes of his career, to lead Denver to a playoff berth by having yet another remarkable season of quarterback play. 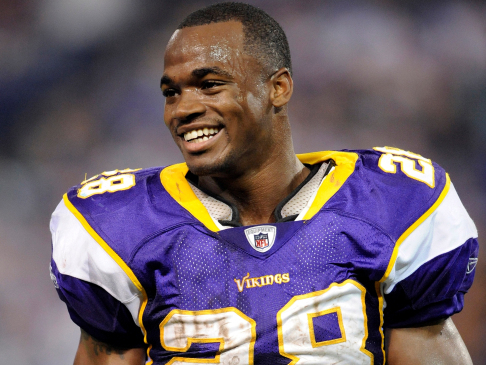 I’m in the camp that says the MVP award has already been locked up by the Vikings all-world running back, Adrian Peterson, who after a devastating knee injury a year ago is by any measure having one of the most astounding seasons in the history of the NFL and is the only real offensive threat the Vikings have. But in an age when passing dominates the offensive game plan and running backs are seen as an interchangeable dime a dozen, Adrian Peterson is the decided underdog in the MVP race. While I understand that this is the way things are these days, it doesn’t mean I have to like it or accept it. What I do know is the MVP debate is largely about semantics. Most valuable player – what does that really mean? The fact is it means whatever someone wants it to mean. And in the NFL, most of those in a position to vote and bestow awards have decided that the league’s MVP honor is essentially a best quarterback award. I believe the only way to level the playing field in this terribly skewed argument is to change the terms and language of the discussion. The best way to do it is to eliminate the MVP and replace it with the BFP – Best Football Player. This would allow voters to consider the whole football player – his skills, accomplishments, impact, leadership and the player’s overall badass-ness. With a formula like that I can assure you that quarterbacks wouldn’t win most of the time. Boxing has just such an equivalency formula. It’s called the best boxer pound for pound. It’s a way of judging who the most skilled boxer is considering all factors. And allows for a way to surmise theoretically how a heavyweight like Mike Tyson might fare against a middleweight like Marvin Hagler – all things being equal. Or how today’s pound for pound champion Floyd Mayweather actually stacks up against one of the huge hard-hitting heavyweight champion Klitschko brothers. The same should be done in football to even the odds that have been stacked against players at positions other than quarterback. Of course quarterbacks play a significant role for every team, and have a disproportionate effect on the outcome of games, but they are not always the best football players on the field. Last I counted there were 21 other players blocking, tackling, running and catching. All of them matter. And a few of them who don’t take snaps from center are actually the best players in the game. So by my revised standard, the BFP, or best football player this season is Adrian Peterson. He is a beast. He is strong and powerful, extremely fast and elusive, and has successfully overcome an injury no football player has a right to heal from this quickly. Adrian Peterson is simply not human. History though has been kind to non-quarterbacks in this debate. For years Jim Brown was almost universally considered the all-time best football player. Modern evaluators now say the greatest football player in history is probably Jerry Rice. In my lifetime no quarterback has ever been considered for that prestigious honor. Fair enough. On Saturday night the winner of college football’s most prestigious award, the Heisman Trophy, will be announced for the 78th time. But despite being an avid football fan I rarely watch the ceremony, because the outcome is virtually pre-determined. I’ve long been a critic of the Heisman Trophy and the way the winners are selected. A couple of years ago I called it the biggest joke in football. Although New York City’s Downtown Athletic Club prides itself in honoring the nation’s most outstanding football player, the problem with the Heisman is that it almost always fails to take into account all of the players on the field, in particular defensive players. The last defensive player to win the award was cornerback Charles Woodson from the University of Michigan in 1997. But he also had to return punts and occasionally catch passes in order for Heisman Trophy voters to feel he was justified in getting the award. In fact no pure defensive player has ever won the award. Notre Dame’s Leon Hart won the award in 1949, but he played both ways as a defensive and offensive end. The second Heisman winner Larry Kelley in 1936 was another two-way player for Yale. An even more damning statistic for the Heisman is that almost all of the previous winners have been either running backs or quarterbacks. Only a couple of receivers have ever won the Heisman Trophy. This year Notre Dame linebacker Manti Te’o is to my eyes clearly the most outstanding college football player in the country. I know there’s a lot of excitement and hype surrounding redshirt freshman Johnny Manziel, also known by the all-time nickname, Johnny Football, from Texas A&M. Make no mistake he is without question a great young quarterback who will garner plenty of Heisman votes. But I just don’t think he is a more important or more outstanding player than Manti Te’o. The last time a pure defensive player should have won the Heisman was just three years ago. That year Nebraska defensive lineman Ndamukong Suh was far and away the most dominating player in college football, but he too was denied the Heisman, finishing fourth that year, behind the winner, Alabama running back Mark Ingram. The vote was a disgrace. 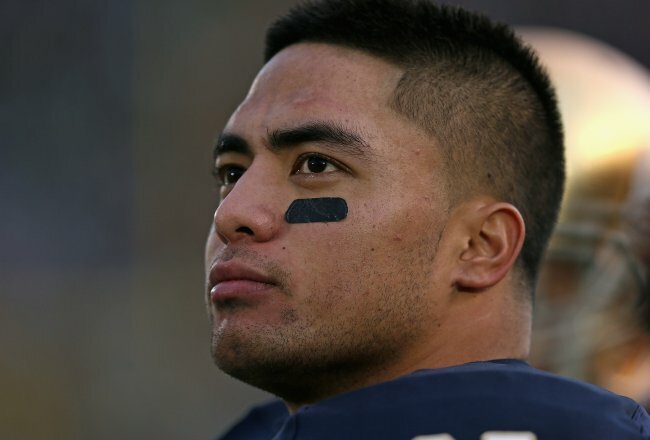 I will reluctantly watch the ceremony this year, if only because I know that Manti Te’o is one of only three finalists being invited to the ceremony in New York on Saturday. The other two are Johnny Manziel and Kansas State quarterback Collin Klein, which means that Te’o will obviously finish no worse than third. But I will forever wonder why is it that the best player on the nation’s number one team is not guaranteed college football’s top prize? It doesn’t begin to make sense. 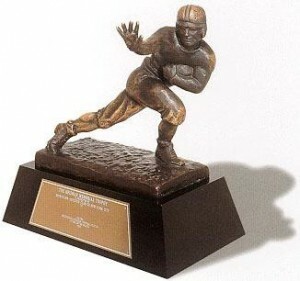 Still I will hope that maybe, just maybe, Heisman Trophy voters will for once do the right thing. You’ve got to be a real hater not to appreciate what Notre Dame has done this season. Saturday night’s win over rival Southern Cal, punctuated by one of the all-time great goal line stands late in the fourth quarter, completed a dream season for the Fighting Irish. The fact is number one ranked Notre Dame has not been a true powerhouse in nearly two decades. And the last national championship and undefeated season for the legendary football program came in 1988. Before the start of this football season, Allen Pinkett, a Notre Dame radio analyst, and a former Notre Dame All-America running back, suggested during an interview that the reason the team has struggled so much is because they didn’t have any “criminals”. “I’ve always felt like, to have a successful team, you have to have a few bad citizens on the team. That’s how Ohio State used to win all the time. They would have two or three guys that were criminals and that just adds to the chemistry of the team. Pinkett was suspended three games by the radio network for those comments. And while the school and many others, were publicly outraged by what he said, privately many more, including this writer, agreed with the point Pinkett so clumsily tried to make: that at its core Notre Dame didn’t have the nastiness needed to be one of the nation’s best football programs anymore. But despite the doubts about his players and the program, third-year head coach Brian Kelly has found a way to return the Irish to glory. It starts with their defense. The Irish have shut down just about every offense they’ve faced this year, allowing fewer than 10 touchdowns for the entire season. 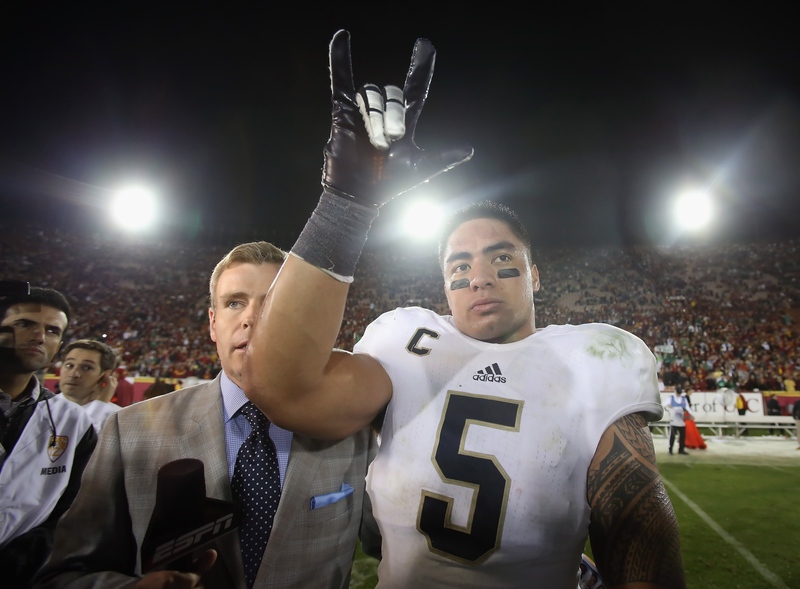 The defensive centerpiece is Heisman hopeful Manti T’eo, an extraordinary linebacker who gets tackles in bunches and has snagged a score of interceptions. The national championship is played in Miami on January 7. It will likely match Notre Dame against either defending BCS champion Alabama Crimson Tide or the Georgia Bulldogs who play for the SEC championship next Saturday. My daughter, a proud Bulldog senior, promptly messaged me after Notre Dame’s memorable goal line stand, to insist that Notre Dame doesn’t have a chance against either SEC team. And as much as I hate to admit it, she might be right, at least based on history. An SEC team has won the last six national championship games. But for at least another six weeks, Notre Dame can bask in the glow of what so far is a perfect season, their best in more than 20 years. As a result, I think it’s now finally safe to say the Fighting Irish are back. I can’t say that I’m surprised by the firing of Mike Brown. I must admit though I didn’t think it would happen this soon even after the Lakers woeful start. But I did think it would happen one day. 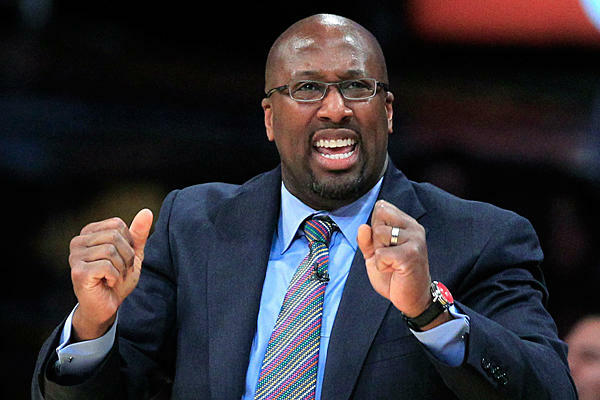 Mike Brown just doesn’t have the “it” factor. Never has, probably never will. Even though he took Cleveland to an NBA Finals series and won more than 60 games twice, the Cavaliers were never really his team. It often appeared that Cleveland area prodigy LeBron James called the shots there as the defacto coach. But beyond his mild mannered public persona, there are other reasons Mike Brown lost his job. The Lakers are the NBA’s counterpoint to the New York Yankees, which means if you’re coaching the Lakers, you’ve got to win big. And Brown struggled to win impressively last season, his first in Los Angeles and he didn’t make the finals, another sin. And as always there were the persistent questions: What does Kobe think? Is Kobe on board? Those questions started before Brown arrived at his first Lakers’ practice and never stopped. The Lakers spend a lot of money on talent. And their fans expect big things. Anything short of a championship guarantees disappointment, round the clock scrutiny, and second guessing, which means in that high pressure environment, the well-paid stars on the court must be coached by a star. Former Lakers’ coach Phil Jackson was a star. He cultivated a mystique from his time with the Chicago Bulls coaching Michael Jordan. Jackson’s mystique only deepened when he coached Kobe Bryant and Shaquille O’Neal when he went to the Lakers. Five Laker championships earned him every accolade. The Zen master indeed. The original leader of “Showtime”, Pat Riley, was a star. Even though it was his first head coaching job, Riley skillfully cultivated his image. The media talked about his slicked back hair, his custom suits, and his supercool demeanor. And by the time we stopped talking about his style he had actually become a very good coach, which shifted the focus to how good he was as a coaching strategist. Riley led the Lakers to four NBA titles. Riley and Jackson of course are rare, but they are the kind of coaches that it takes to win over an anxious and demanding media market like Los Angeles and manage the massive egos of the star players they coach. Also what this means is without that kind of gravitas, players can’t or won’t play hard for you. They won’t listen or do what’s needed to win. And that’s what sunk Mike Brown. It takes quite a coach to lead and direct a guy like Kobe Bryant who has played 17 star-studded years, or to inspire a dominant but often childish big man like Dwight Howard, or squeeze a few more big moments from an aging, two-time MVP like Steve Nash. Mike Brown just wasn’t that guy. I know the critiques of Brown are highly subjective, and perhaps unfair to a hardworking, knowledgeable guy who most certainly has paid his dues learning his craft from some of the best – like San Antonio’s Greg Popovich. So yes, Mike Brown does in fact know his X’s and O’s. Unfortunately though he’s never made the best impression when it mattered most. I’m hoping one day he will, but he was clearly miscast in LA. It’s been 11 years since Michael Vick left Virginia Tech to become the first pick in the NFL draft and teased us as a once in a lifetime multi-threat, passer and runner for the Atlanta Falcons. He was the rare athlete many thought would transform the quarterback position in the NFL. He’s 32 years old now and his debut seems long ago. And so far Michael Vick has failed to achieve those lofty expectations. Now the clock appears to be ticking down on a career that can at best be described as a disappointment. Yes, there have been truly unforgettable, sensational moments, when Vick has done the seemingly unbelievable, by either running or throwing the ball. But there are also huge gaps in-between, marked by inexplicable fumbles, untimely interceptions and numerous injuries. 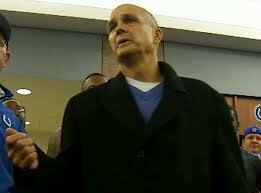 And there is Vick’s dark side: resulting in the dogfighting conviction and subsequent prison time. But we can also point to his humbling redemption which allowed us to see a wiser changed man off the field of play who has apparently taken responsibility for his actions by becoming an earnest spokesman against cruelty to animals. But in pads, aside from the occasional hints of greatness, like two seasons ago when he made Eagles fans forget about Donovan McNabb and made a legitimate run at league MVP, he has largely underachieved. The Monday Night Football game against the New Orleans Saints provided the starkest contrast in quarterbacking by which to evaluate Michael Vick. His signal calling opponent was Drew Brees who was drafted the very same year as Vick and by NFL standards is approximately the same, short-statured, six-feet in height. 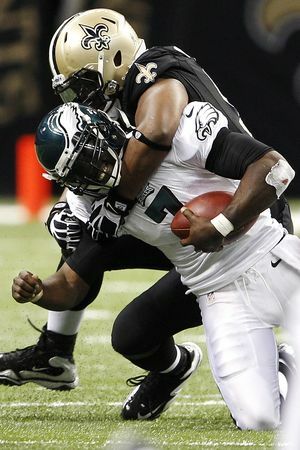 On Monday Brees was much better than Vick as he helped New Orleans hand Philadelphia its fourth straight defeat. Drafted in the second round, Drew Brees’ career has far exceeded what were relatively modest expectations. And he has trounced his 2001 rookie counterpart statistically. Brees has nearly tripled Vick in touchdown passes: 303 to 121. And he’s more than doubled Vick in passing yardage: over 43,000 yards to just under 20,000 yards for Vick. And even more importantly unlike Vick, Brees has won a Super Bowl. It’s the kind of career many of us thought Michael Vick would have. Still, it would be a shame to see a man with so much talent, with so much speed and elusiveness, who is also complemented by a phenomenally strong left arm never get to achieve what looked like limitless potential. In fairness, Vick’s apparent decline is not all his fault, some of the blame rests with Eagles head coach Andy Reid, whose questionable play calling has made play extremely difficult for Vick. And it doesn’t help that Vick must defend himself with seemingly no help from his offensive line. Making matters worse for an aging Michael Vick is the success that many of the young quarterbacks who’ve just entered the league are now having. Further, Vick’s replacement in Atlanta, Matt Ryan, who is appropriately nicknamed “Matty Ice”, has led the Falcons to an 8-0 record, which is something Vick never did. Ryan has just about made fans in Atlanta forget the Michael Vick era. But I will close with what I hope is some perspective here, even as we fans lament the decline and potential fall of Michael Vick’s football career. It is important that we recognize that at least it seems the time Michael Vick spent in prison, and his reflections upon his crimes afterwards have made him a better person, if not a better quarterback. When cancer-stricken head coach Chuck Pagano, breathlessly congratulated his team Sunday afternoon, as he visited the locker room after they had beaten the Miami Dolphins, it started to look like the NFL’s best unfolding story is the heartwarming turnaround of the Indianapolis Colts. The Colts having let go of all-time great quarterback Peyton Manning after finishing a league worst 2-14 last season were expected to be a bottom feeder team at best once again. But expectations can always be wrong. Rookie quarterback Andrew Luck despite being the number one pick in the draft was expected to be good but like most quarterbacks in their rookie year was also expected to struggle. But at the halfway point in the season, Luck has already passed for more than 2400 yards, and Sunday set the all-time rookie passing yardage record for a single game. But no one, and I mean, no one, expected the Indianapolis Colts to be 5-3 at the halfway point of this NFL season. Which means all of those prognosticators will have to admit that something special is happening with this team and it’s possible all of them could be wrong. The next several games on the Colts schedule now all seem winnable, and the playoffs are not only possible but are beginning to look probable. Playoffs! No Jim Mora exasperation this time. What about Peyton Manning you ask? Manning is having an extraordinary season with his new team the Denver Broncos, especially considering the doubts about his future with four surgeries on his neck. But although Manning is gone so too is the heartache over his loss. Seven months ago Indianapolis was torn over the loss of Peyton Manning. But a winning record a really good rookie quarterback, superb receivers, a solid running game and a feisty defense, have eased the pain of Manning’s departure. Also redeemed is Colts owner Jim Irsay, who now looks like a prophet for his decision to release Manning and to remake the team by letting go of a bunch of other veterans and firing future Hall of Fame GM Bill Polian and bringing in the untested Ryan Grigson to evaluate talent in Polian’s place. The harder decision of course was saying goodbye to Manning who almost singlehandedly gave the Colts a national profile and also gave Irsay credibility. While coach Pagano continues with leukemia treatments, the team he has helped inspire plays on without him, renewing hopes in Indianapolis by proving that being knocked down doesn’t mean you can’t get up. The country’s number two sport tipped off Tuesday night. NBA basketball is back for another hopefully stellar season. For those of you who are still under the delusion that Major League Baseball is America’s number two sport, I have five words for you: The TV ratings say otherwise. MLB’s crown jewel – the World Series – just posted all-time low TV ratings on Fox, which means the NBA Finals, last June, beat baseball again when it mattered most. Now that I’ve gotten that out of the way, let’s talk hoops. LeBron James is no longer carrying around that monkey. He’s finally a champion. The man who took his talents from Cleveland to Miami has played in two straight NBA Finals with the Heat and won it all last season. Since leaving high school nine years ago, he’s played in three NBA Finals. 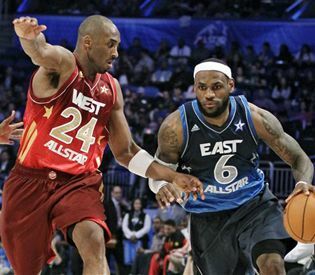 Will it be Kobe and LeBron in the Finals? But his sole title still leaves him 10 titles short of Bill Russell, five away from Michael Jordan, and Kareem Abdul Jabbar and four titles to tie Kobe and Magic in his quest for championship greatness. Nonetheless I won’t make the Heat the outright favorites to win it all this season. I think the Lakers will have something to say about that, now that Dwight Howard, the NBA’s best center, and Steve Nash the NBA’s best pure passer, have both joined Kobe in LA. Right behind the Heat and the Lakers are the OKC Thunder with Kevin Durant and his sidekick Russell Westbrook. Gone though from the Thunder in a trade just days ago, is the league’s premier sixth man, shooting guard James Harden. The bearded one who did almost nothing in the Finals for OKC is taking his hairy distraction to the Houston Rockets. But his instant energy will be missed, and is why I have to rate the Lakers over the Thunder in the West. But several other teams out West will be heard from. Of course Tim Duncan, and his San Antonio Spurs running mates, Manu Ginobili and Tony Parker will pose a serious threat, as will the Denver Nuggets and Los Angeles Clippers. In the East chasing the Heat will be Boston, Indiana, Atlanta, Chicago, the Knicks and maybe even the Nets who’ve moved from Jersey to Brooklyn. But this year there will be a full slate of 82 games, not the condensed lockout revision from a year ago which saw only 66 games crammed into the abbreviated season. When all is said and done though, provided there are no injuries to key players, I expect Miami to beat the Pacers to win the East and advance to a third consecutive Finals to face the Lakers. My pick – sorry LeBron, are the Lakers, now fortified by Dwight Howard and Steve Nash who are hungry to win their first NBA championships. Which also means Kobe wins his sixth title to tie his much older nearly twin brother Michael, as the Lakers win the series 4 games to 3 in what will be the NBA’s highest-rated Finals ever, with once again, millions more viewers than Major League Baseball.